It was the first decent sized spring tide of the series so my pal Nigel and I decided to see if there were any maggot feeding mullet about. In the car park we met another friend, David, and the three of us set off together. As we tramped along the boulders we were each armed with a spinning rod and a fly rod (David was just carrying his spinning gear). The idea was, as usual, to spin for bass unless we saw mullet feeding 'off the top' when we would switch to the fly tackle and try for them. 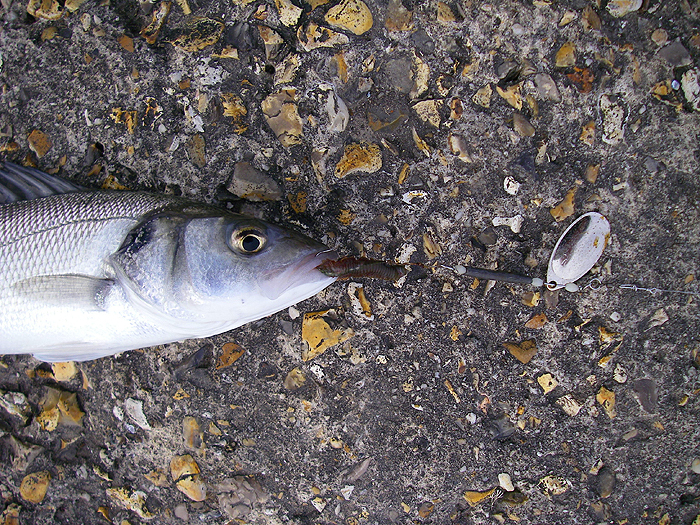 The problem was that neither of us had managed to get any maggots to use as bait so even if the mullet were maggoting it would be a struggle to get bites. As it turned out it didn't matter. As we walked along sun blazed down, the sea was pretty calm and clear and we saw nothing - until we rounded the first headland. As we did so I said "there's a fish!" and a nice mullet sprang into the air before plopping back. Within minutes we could see mullet leaping all over the place, clearly there were a lot there. On the bach was a small patch of maggoty weed but the tide had not yet reached it and there was no sign of surface feeders. Following our plan we began to spin - Nigel with a plastic eel and me with a plug. It was slow although there were clearly stacks of mullet still about and we had quite a few 'line bites' and possible pulls as we spun. After a while I hooked a decent fish and played it for perhaps ten seconds before it came unstuck - there were no scales on the trebles of my plug so I assumed that I'd just lost a bass. We fished on and the taps and nibbles continued. I decided to switch to a Mepps in case there were bass that were too small to tackle our lures. The switch sort of paid off when after a few casts I hooked and landed a schoolie. I took its picture and returned it before casting again. Still we were failing to hook anything although David had played a sizeable fish on his Slug-Go before it came unstuck. Not our evening? 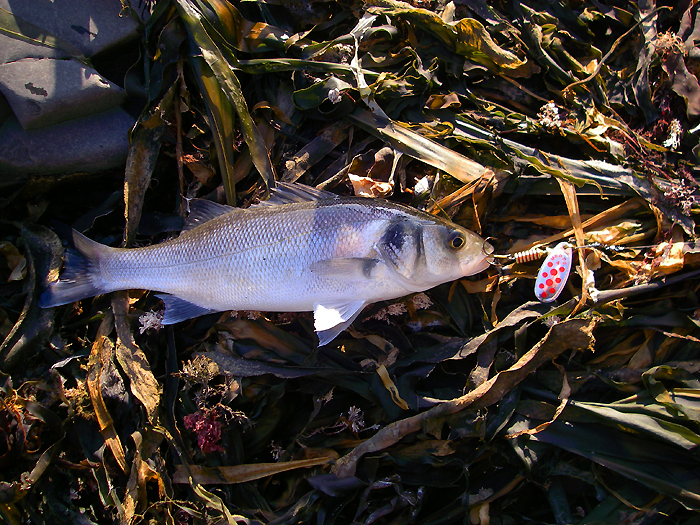 The tide had begun to ebb so we decided to pack in but, we had only walked back about twenty metres when we saw that the shallow, wrack filled, water was absolutely heaving with mullet. There must have been literally thousands of fish, of all sizes, cruising about just sub-surface. It was too much to resist so Nigel and I laid down our gear and picked up our fly rods to have a go. Despite the sea being solid with fish it was more or less futile, Nigel's dry, maggot-fly was totally ignored and my small streamer (in hopes of a bass) wasn't doing any better. 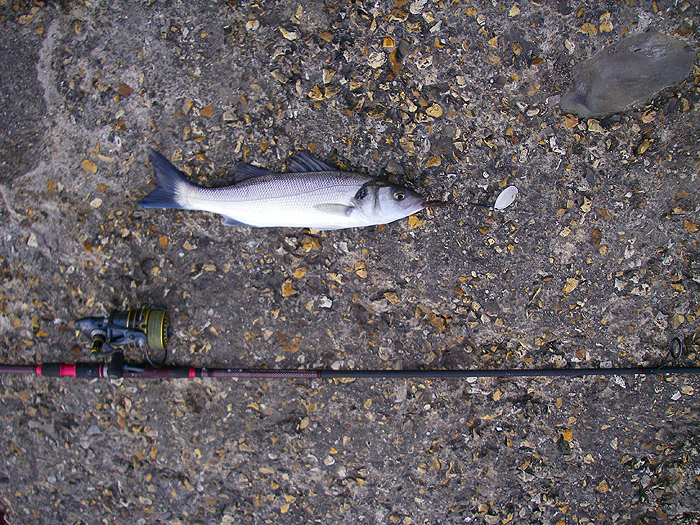 After ten or fifteen minutes of flogging the water I eventually had a 'bite' and hooked a fish which turned ot to be a fat mullet foul-hooked in the flank. 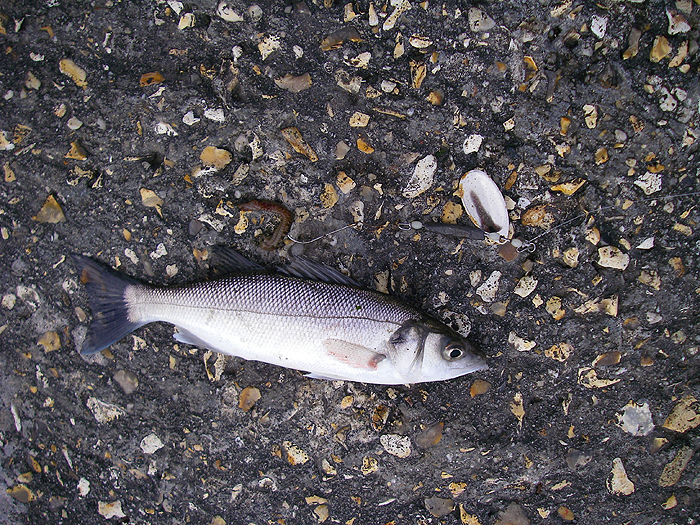 I played the fish in, took its picture and put it back before we 'gave them best' and returned home. The following day Nigel wasn't able to go but I decided to give it another try. This time I'd bought myself a few ragworms to use with one of my home made baited-spinners. I reasoned that with the mullet so thick on the ground (actually in the water) they would be bound to have a go at my spinner. The disappointment came when I got out of the car to find that the wind had increased and changed direction. On the beach I found David looking disconsolate and telling me that he felt it was too rough to try where we'd seen all the fish on the previous evening. Undeterred I tramped along but when I got there the pounding surf suggested that I should have listened to my pal. The sea was rough, dirty, full of weed and there wasn't a sign of a fish. Half-a-dozen casts showed me that it was futile so I walked all the way back to the car park. Before I got there I rounded a corner in the cliff to find a sheltered, relatively calm area of water. Might as well have a go! 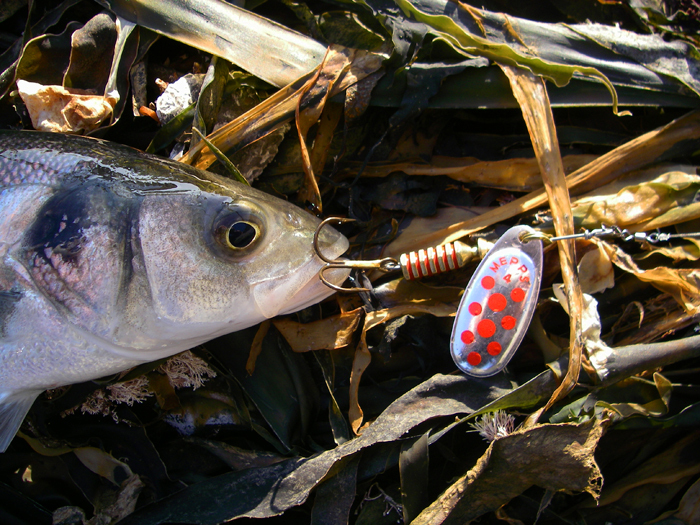 Within minutes the rag-baited spinner was taken by a schoolie then on my last, last cast, I hooked the smallest bass so far this year. I took this as the sign to pack in and went home. Funny, unpredictable business fishing! My first bass - from the midst of a thousand mullet. Meppsed! This was a size 4 spinner. 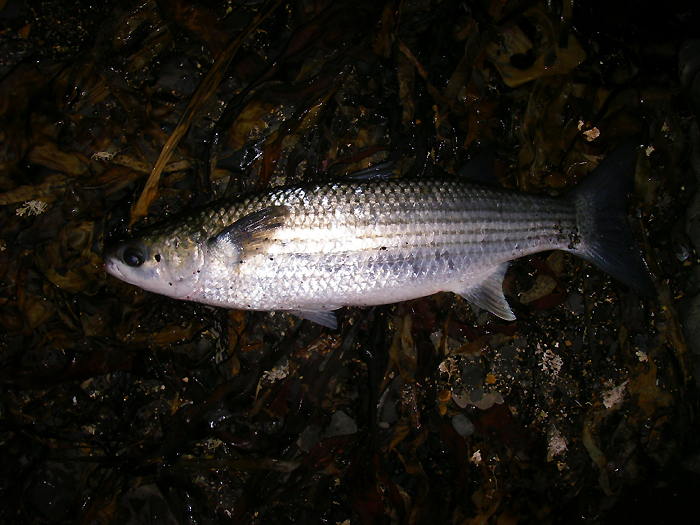 First mullet of the season for me - pity it didn't take the fly. A schoolie on the baited spinner. Nicely hooked on the ragworm rig. My tiniest bass for ages.